Germany will soon face blackouts and will pay dearly for our nuclear and coal generated electricity. German industry will find it impossible to operate with power delivered by intermittent energy sources and will relocate to third countries. The cost of Energiewende will drive Germany into energy poverty. Power prices will steeply increase due to shortages of reliable (understand conventional/thermal) supply. Time has proved them wrong on all points. The German grid is one of most reliable in Europe. According to data published by Agora, a leading German energy focused think tank, German electricity consumers suffered only 10-20 minutes of unplanned interruptions per year per customer. Countries with higher share of conventional and nuclear generators in their mix, such as France and the UK, report statistics of 5 to 6 times more than Germany – that is, 50-60 minutes of unplanned interruptions per customer per year. Far from leaving Germany, the German industry is still a bedrock of German economic stability. According to World Bank data, the value added of industry as percentage of GDP was 30.3% in 2014, which is by far the largest in Europe compared to 19.6% in France, 22.4% in Spain or 20.9% in the UK. Power prices have been decreasing over the last 5 years in Germany while installed capacity of intermittent sources increased by over 60% over the same period. In 2016 Germany had 87.4GW of PV, and on- and offshore wind, in 2011 this number was 54.2GW. 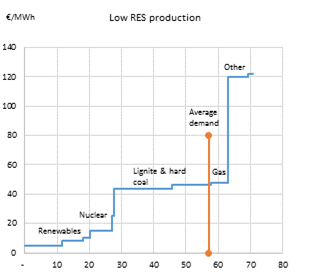 The chart below clearly demonstrates that renewable energy does not lead to increases in wholesale power prices. On the contrary, wind and solar power with zero cost of production lead to decrease of wholesale power prices. This effect known as the “merit-order” effect is illustrated by the below chart. During days with average sunshine and wind, hard-coal fired power plant supplies the last (marginal) megawatt hour of electricity to meet demand and hence sets the market price. The cost of generating that marginal megawatt hour from hard coal was approximately EUR 34/MWh in 2015. In times of large generation from solar and wind sources, power price drops to zero or becomes even negative because generators with close to zero cost of production are able to meet the whole demand. This effect pushed the average annual price down. Wholesale power price in markets dominated by wind and solar is thus lower than it would have been without wind and solar generation. Many observers from neighboring countries expected Germany to rely on imports to keep the lights on once it starts shutting down nuclear plants. Those expectations also proved wrong so far. Germany has become Europe’s second largest exporter of electricity in 2012, second only to France. Since then German net exports have only increased as the below chart shows. So, considering that none of the nightmare scenarios feared by CEE politicians played out, why do they still seem to have a problem with Energiewende and can’t come to terms with German energy policy? We believe it is precisely because of the above described merit-order effect. Utilities in CEE countries tend to be state-owned. Those utilities have a relatively large share of fixed to variable costs, mostly because their generation portfolios are dominated by coal and nuclear. For as long as Germany will be adding more wind and solar generation to its power mix, wholesale prices will remain low. This means that capital intensive projects, such as new nuclear plants in Czech Republic and Hungary, will not be realized. Coal and nuclear power plants need power prices at least two-to-three times higher than the current power prices to be able to recover their investment cost. Energiewende, one may argue, also contributes to a cleaner and safer fuel mix in neighboring countries as the planned coal and nuclear projects are unlikely to be completed. Hungarian government is very committed to construct Paks II and wholesale prices seem to have not so much importance. It has also been recently confirmed that the government didn’t intend to see more wind turbines in the country. Currently it seems that the only obstacle to build Paks II is if EC finds any breach of related EU level regulations. EC has recently ended its proceedings and accepted that Hungary contracted Rosatom without any tendering process. Countries planning to build new nuclear power plants will spend billions, just to notice halfway what a waste this is, leaving ruins of unfinished nuclear projects, like in Kalkar in Germany! Central and Eastern European (CEE) Countries is an OECD (Organization for Economic Cooperation and Development) term for the group of countries comprising Albania, Bulgaria, Croatia, the Czech Republic, Hungary, Poland, Romania, the Slovak Republic, Slovenia, and the three Baltic States: Estonia, Latvia and Lithuania. 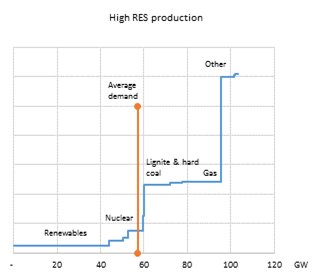 Previous PostThorium: a future option for nuclear?